LIGHT rail's Sydney CBD and South East and Newcastle projects have received less-than-glowing reports from the New South Wales Auditor-General, while the news has been far more positive for Parramatta, where major construction will begin in coming months after two major contracts were awarded to build and operate stage one to connect Westmead and Carlingford via Parramatta CBD and Camellia. WITH a state election imminent, New South Wales has been offered little to date by way of political promises on rail. NSW residents will cast their votes on 23 March – only five months after passenger and freight rail policy was prominent among contenders campaigning for office in neighbouring Victoria. However, few statements of any significance have been forthcoming in NSW thus far. The single biggest rail-related announcement was made on 4 December by the Liberal-Nationals government, when Premier (and former Transport Minister) Gladys Berejiklian released a proposal to introduce “faster rail” between Sydney and four major regional cities. On 7 November then Opposition leader Luke Foley said his party would prioritise public transport over tolled motorways, indicating that Labor would set up a $13.5 billion “acceleration” fund (boosted by $6b from a federal Labor government) to support public transport improvements in Sydney including a Metro West line between Parramatta and the CBD and an extension in the first instance of the South West Rail Link to the new airport at Badgerys Creek. THIRTEEN years ago Australasia’s biggest working demonstration of rail industry products and services was born. Hosted by the Rail Track Association Australia (RTAA) in conjunction with Rail Corporation New South Wales’ infrastructure division, the inaugural RTAA/RailCorp Rail Industry Field Days were held on 29–30 March 2006. As its venue organisers chose the Clyde railway yards in western Sydney – a site that enabled suppliers to show off their capabilities in a real-world setting. “Everything from an innovative computer-controlled ballast plough to a unique state-of-the art rail-mounted fire engine had pride of place,” freelance rail journalist (and now Track+Signal associate editor) Leon Oberg said. Now co-ordinated by event manager Encanta on behalf of the RTAA, the field day will take place on 3–4 April this year at its traditional home in Clyde, with both the outdoor exhibition area and the Fettlers’ Shed fully booked for the duration of the two days. WITH a federal election looming, politics was front and centre in the minds of attendees at Australasia’s biggest annual rail conference and exhibition, AusRAIL, when more than 750 official delegates and many more visitors converged on Canberra over two days in late November. Two men with perhaps the greatest vested interest in the coming national vote – which must be held at the latest on Saturday 18 May this year – shared the limelight as speakers on the second morning: Michael McCormack, Deputy Prime Minister and Minister for Transport, Infrastructure and Regional Development in the incumbent Coalition government, and shadow minister and deputy leader of the Opposition Anthony Albanese, who will almost certainly succeed Mr McCormack in the role if his Australian Labor Party wins office. Rather than take aim at each other, however, the pair voiced considerable mutual respect for their Parliamentary adversaries. 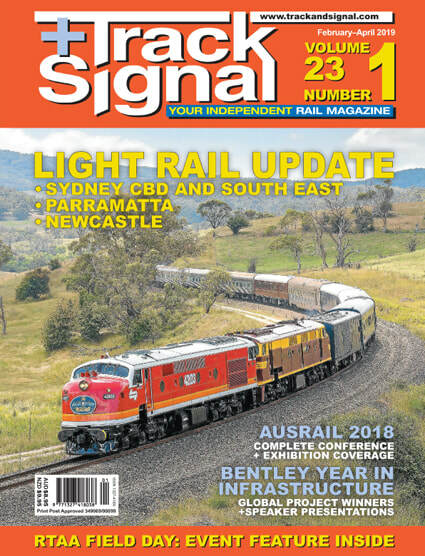 ﻿﻿﻿Track+Signal is distributed by Integrated Publication Solutions to retailers throughout Australia and New Zealand. ​​If your local newsagent does not currently stock Track+Signal, ask if they will order it for you – they need only contact account manager Anthony Cribbes at IPS to arrange for it to be added to their regular magazine and newspaper order.